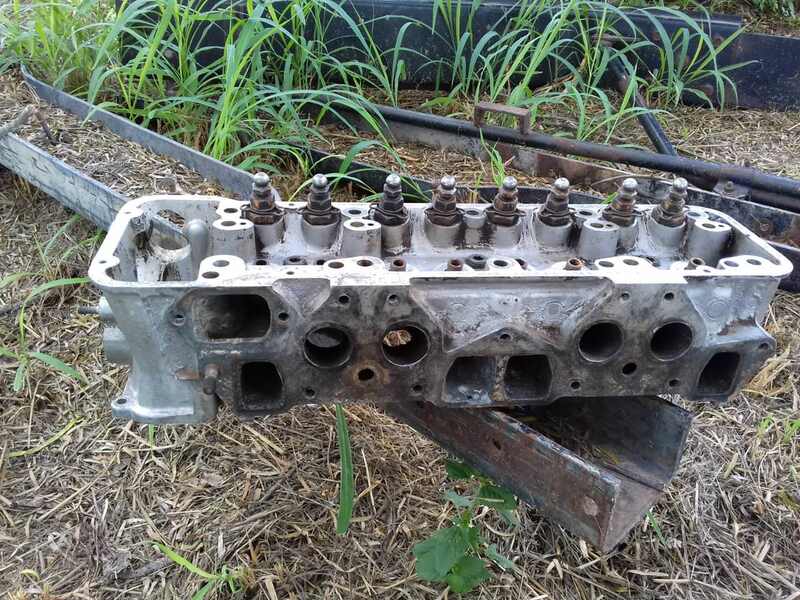 Just like the title states, if you have an L20b head for sale please send me a text message,.I'm trying to help out another starting datsun fan get his truck running; so please try to keep the price low. I have a few stock late L20B W58 emission head CORES $75 + shipping. Also have one that was rebuilt many years ago, NEVER RAN, so never had engine oil to coat metal parts, so has light oxidation, would need to be taken apart & cleaned. $150 + shipping. PM if interested! He's running a A87 head, do tou think the emissions head will work okay ish with the emissions head you have? I know all the heads interchange, but do the manifold and intake fit without modifications? '75-'77 will be a U67. W-58 from '78-'80. Either will work and the manifolds bolt up however the W58 uses water cooled intake and the U67 didn't. You can easily drill two 3/8" holes in the U67 head to 'convert' it. Just put the gasket on and mark the holes. The W58 that has the holes will replace the U67 and the gasket and non water cooled intake will seal this. Just got informed he has a A87 head. What head can I run that will fit better on his L20b. Its for a 620 pick up truck. Pretty much all of the 4cyl heads will fit, will bolt up to the L20B..............it's really all about what combustion chamber, what valve sizes & what port sizes you want. The W58 head is OPEN chamber, big valve, big port HOWEVER it is an emission head with the steel "pre heat" tubes in the exhaust ports. On a basic street L20B, I don't think you would notice any performance difference. It is a waste of time trying to remove them, so that is not an option. Other problem is WHAT A87 head did your engine have on it? The A87 casting was made in many different configurations.......NOT necessarily all being the best! There were A87 OPEN & CLOSED/PEANUT chamber, there were small valve & big valve, there were small port & big port. That's why you have to remove an A87 from an engine to identify the combustion chamber & the valve size! Bottom line, what is the budget? The last head I had rebuilt cost $650 with all new parts AND with the cam installed with the correct lash settings. $150 for my rebuilt "BUT NEEDS CLEANING" is a steal! To install an old USED head on anything today, is just not a good idea......unless your budget calls for it! I have simply haven't had a Datsun that needed a new cyl head on a budget recently, so have never installed it! 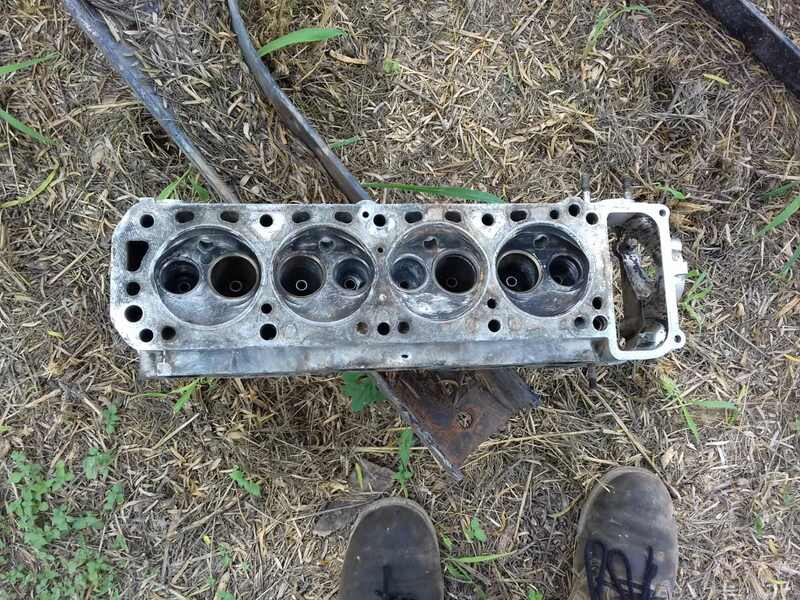 This is the head, the owner of the L20B has. I really don't know his budget, I'd have to ask him really. Not a W58 (has square exhaust ports) or a U67. 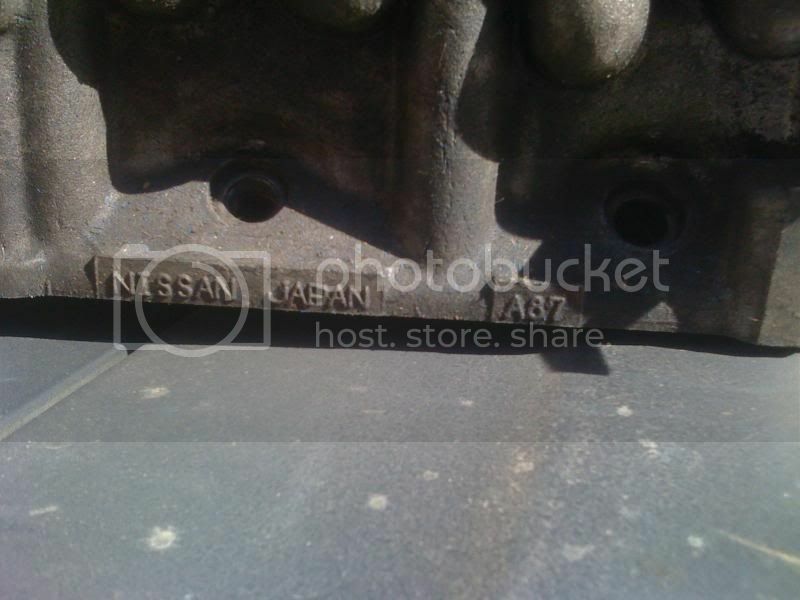 (has water ports under the intake ports) Valves look too large for an L16 210 number head. You definitely don't want a 210 head on an L20B. Look just behind the fuel pump and below and between the #1 and #2 plugs down along the bottom of the side. Probably A87. The A87 is probably the poorest L20B head with small ports and valves. It would be better on a smaller L18. Apparently they were supposed to come on the early L20B but can't find any reference to this. The first use of an L20B was the '74 610. '74 was also the year the L18 was used in the 710 and 620 with an A87 head. From '75 on the U67 and later the W58 heads were used. To add more confusion, lots of import engines flooded into N Am in the '80 and those heads were swapped onto L engines cheaper than doing a valve job. This one is stripped. Try to find a U67 that's more complete. An A87 will work though. I got a few complete L20 heads, not sure whats embossed on them, will look into it this weekend. Whats your location and zip code ? since it took 3 days to respond back, I've decided this might drag out longer then I'd like to deal with. Sorry, just see a pattern like whats happen on the form before. Good luck, sure someone has lots more time then me to deal with your needs. My bad, wasn't trying to be a jerk, been morre worried about my grandma that is in the hospital and my university midterms than on the head. Plus, this doesn't notify me when I get a message from this post, only when I get a private message. If your still interested in doing business then Im still available, if not no worries. Have anice day. ?